We are in the process of final bookings for our spring concerts. If you want to schedule us to sing for you, contact us as soon as possible. If you want to know when our public concerts will be, watch this space or contact your favorite Singer. We will put information up as soon as we finalize the dates/times. Do you need us to sing at your next event? Call or email us to discuss availability! Broadmoor is available to perform for arts festivals, weddings, memorial services, town celebrations, holidays, family reunions, businesses, schools, nursing homes—anywhere music lovers can be found! To learn more about our rehearsals and concerts, or to support the Broadmoor Chamber Singers: Call the phone number on our "Sing with Us" webpage or send email to broadmoorsingers@yahoo.com. 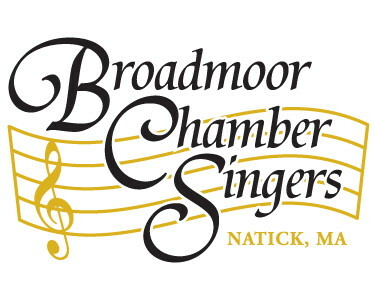 Broadmoor Chamber Singers, a community chorus founded in 1979, enjoys singing classical, jazz, folk, spirituals, gospel, and popular music in all voice parts (SATB). Solo opportunities are available. The singers include neighbors from all walks of life — accountants, students, journalists, stay at home parents, music teachers, engineers — and new members are always welcome. Please support the local businesses which support us and the arts in your community!